Obviously, the vast majority of the work that I do is game-related. Not ALL of it but 95% at least. When I get a project that falls outside of that standard I'm always a little excited. 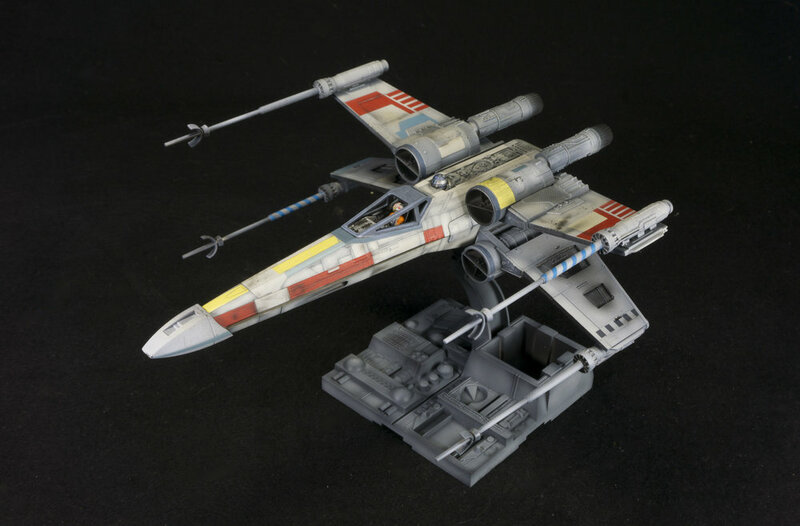 When I was asked to do a build-up of the Bandai 1/72 scale X-Wing I was thrilled! If you're unfamiliar with Bandai, you've probably see their stuff before. They're mostly known for their vast array of Gundam models, though that's not the only thing they do. They've been doing models for a very long time and they're are known for their detail and the cleverness of their designs. That is all on display with this kit. This kit goes together brilliantly. It's essentially a snap-kit. That is, you could, if you wanted, put the whole thing together without the use of glue. I wouldn't recommend it but it's clear as you build it that it's possible. On top of that you are given options to build this specifically as Luke's "Red 5" or some of the other craft featured in Star Wars. The physical differences between the different versions are so small that only a real super-fan would be able to tell the difference (I wouldn't be able to) once it was painted but still the variant parts are there if you want them. Another thing of note in this kit is the markings set. There are actually two sets. One is a standard water-slide decal set. The other is an adhesive "sticker" set. To be quite honest I have no idea why they bother with the stickers. They might work for flat surfaces, but I actually experimented with some of the smaller ones on curved surfaces (I was curious) and they just do not work. At all. But you can just throw those out and go with the others. They are nicely printed graphics. Perhaps a BIT thicker than I might like. The only problem with them is that they take a lot of effort to conform to the details (panel lines, etc). They will conform, though as long as you have some Micro-Sol on hand. There are decals for everything, too. I expected to have the red markings and maybe the yellow and blue ones but they also include decals for some of the areas where the panels are a slightly different color than the hull. There's a decal for the canopy color! I suppose if you're using the clear piece that keeps you from having to mask it (I used to non-clear canopy) so that's a nice addition. I actually tried it and it's... ok. Painting will look better but if you wanted the clear piece and weren't up to it then you'll probably appreciate it. The helmet decals for the pilot are nice as well and they include a lot of extras because working on things that tiny is tough. I managed to only screw up one of those. Painting this was really fun. I started with a black basecoat and then painted the hull with the airbrush using white paint and focusing on individual panels starting in the center and working outwards. I use this technique a lot for surfaces that I want to appear aged as this gives you a starting point where the paint looks faded and dirty. Plus, there's really no way to do each panel exactly the same every time so you get a really good realistically varied look to it. I did work a bit from reference photos of the studio models to make sure that I got the right overall feel from the paint job, but I also put a lot of my own style into it as well. For example, the kit recommended a mix of white with a small amount of Light Ghost Gray to get the hull color. I started with white, then used Warcolors Warm Grey 2 lightly sprayed over the whole thing to reduce the contrast of the panel lines and to add some warmth to the color. Weathering is something that you just have to play with slowly and build it up until you're happy with it. Warcolors Transparent Black came in handy here. I used it to provide some subtly shadowed areas as well as some of the more dirty and blasted areas. What I didn't do on this kit were any washes. None. That's weird for me, but as I was working on it I didn't think that they would work well with the look I was trying to achieve. I definitely could have done more with this, but eventually you reach the point of diminishing returns, or worse, you start making it worse. I think this was a good stopping point. 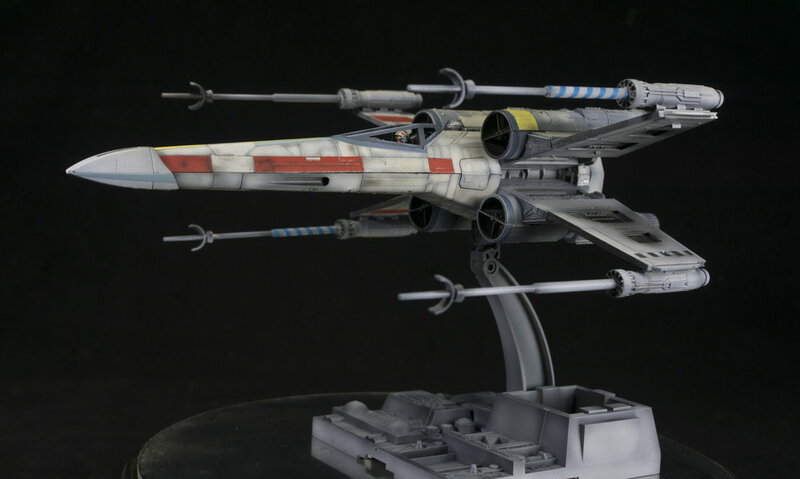 Now I'm wondering if I need a 1/48 scale Fine Molds X-Wing. At this point I have just placed my fourth or fifth order with Warcolours. When that order arrives, not only will I have the entire current range of paints, I will also have purchased backups for paints that I know I will be out of shortly. With that in mind, I thought I'd give some more thoughts on the paints now that I've been living with them for more than six months. Especially given that I continue to get questions about them in my YouTube video comments from people who see me using them even though I did a review of them back in June. First off, let me say that Warcolours Paints did not replace my other paints. At least, not entirely. All paints seem to have their niche for me. What Warcolours does really well is layering and blending. All of the colors tend toward the transparent side (even those marked as "opaque") which makes them ideal in this task. But this also means that if you want to get a quick base coat of a lighter color they are not going to be the paints that I reach for. On the other hand, if I want to build from dark to light they work great. I've really come to depend on their Red range in this capacity. Want a really dark red? Start with a black base (usually primer black for me) then work from Red 5 to Red 3 as your core colors and maybe add some paint highlights with the lighter reds. Works great! But if you want to have a brighter red with less work you might want to base with something from the Citadel base range as that will get you to that core red faster than Warcolour's Red 3 will. Unless you're using an airbrush, of course. Airbrushing the colors on pretty much negates this issue. One thing I recently tried out was some of the metallic colors. I was a little concerned because the metallic flake in the bottles was fairly apparent which made me think that it was going to look "glittery" on the models. My favorite metallic paints are those with fine metal flake (Citadel and Vallejo both do well in this regard). Still, I tried them out and after some initial trepidation, I found that once you have a couple of light coats on the surface smoothed out and you get a good result. Not every experience with the metallic paints was super positive. I tried out the Black Copper paint and found it to be slightly darker than the standard copper when I was obviously expecting something much darker. Now, that could be on me. I did thin it some when I was using it and that might have changed how it performed which is something that I've noticed about all metallic paints - they don't seem to like being thinned much - but still, not what I was expecting in terms of results. As you might imagine, I'm not finding a lot of circumstances where I need the transparent range. When I've used them, I've loved them. When I did my Halo Covenant ships the Violet and Purple over silver worked wonderfully and transparent paints are the only way I could have imagined getting that effect. But these kinds of things don't come up that often so, as with all of my other transparent paints - Badger, Tamiya, they mostly just sit unused). These types of "candyapple" colors are done by applying a metallic base coat with a transparent color over the top of them. As for the florescent paint and the glazes... I keep forgetting to experiment with them. So at this point I have no opinion. I'll continue to provide more thoughts on the color range as I continue to work with the paints. Suffice it to say that I really am enjoying working with the paints even if they don't replace every other paints I own. After I recorded the video I continued working on the models. What I decided after completing my first batch is that overall the minis are actually harder to build than I first thought. One of the minis that I hadn't gotten to yet was the Watcher. This has similar problems to the Phoenix that I mentioned in the video. Lots of small pieces and not instructions to help. Now, I don't think that this one is quite as impossible to assembly without assistance, but I think that you'll end up having to do what I did and really study how other people have put it together. You'll also realize that while many of the pieces have a clear home, some of them are open to interpretation as no two photos of the Watcher seem to agree on placement on some of the pieces. In the end it's no big deal as there are any number of ways you could put the detail pieces on and have it look good. The White Lion ended up requiring a lot of sanding to get rid of the seam lines between the pieces. Even with as careful as I was in assembly and gluing there were a couple of decent seams in the back end. Not a lot of work, but worth mentioning anyway. The more annoying seams were actually around each ankle where the feet attach since those pieces have a lot of recessed detail. The Butcher, the Hand and the King's Man all had some fairly challenging bits. My biggest problem with all of the models is the use of joins with no positive connection points. That is, when two or more pieces can go together in an effectively unlimited number of ways. The King's Man's legs are like this. The rear half of the White Lion had this issue as well (which is why it needed so much sanding). The difference with that is you could easily see where it should go even if there was nothing in the design of the pieces helping you to get it into position. The survivors are probably the easiest to assemble overall. I mentioned the small feet and the possible problems of those connection points on the base. Well, it was worse and better than I thought. Worse because the models are meant to be mounted to special bases that have sculpted faces on them which makes trying to find good connection points for the feet a little tougher than normal. Better because the plastic cement seems to hold them to the base just fine (even with the tiny feet and sculpted bases). I'm probably going to be doing more videos on this project because there seem to be a lot of interested people out there. Not surprising considering how well the Kickstarter did. I recently got a commission to paint up some of Knight Models' large-scale superhero models. The group consisted of Iron Man, Batman on the Batpod, and the Sabertooth vs Wolverine vignette. I started with Iron Man. When I opened it up I was immediately struck by two thing. First, there were no instructions - and the model had a LOT of small parts. Second. The casting was not ideal and was going to require a lot of work. At this point I was actually kind of mad. Seriously annoyed. I had to break out the Dremel to start the cleanup as some areas actually required grinding. There were also areas where there was significant pitting or textured (which usually comes from having the metal at the wrong temperature while pouring). Then I had to refer to all of the photos that I could find of the model as the front view on the packaging was the least useful view of the model for assembly. The back is full of little veins plates and such. anyway, it was a lot of research to figure it all out. Here's the funny thing, though. At some point I really started enjoying the process. I was brought back to my earlier years of painting. Instructions were a rarity, casting was dodgy, and part of the modeling process was making the best of it all. I should also mention that all of these kits are made from an old-school lead-based pewter. So that helped bring the whole nostalgia feeling to life. Don't get me wrong. I don't really miss "the good old days." I LOVE a well-cast plastic mini that just falls together with a minimum of work. On the other hand, there's something to be said for being able to overcome the problems that these kinds of kits present. I get to see how far I've progressed as a modeler as well as a painter. Another bit of adversity that I needed to overcome was the fact that Wolverine was actually missing most of his teeny, tiny claws. I had two choices. Try to contact the manufacturer and wait possibly weeks for replacement, or replace them myself. I went for the former solution. What I did was to take a small piece of metal (I think it was a door panel from a 15mm tank), pounded it thin with a hammer, then used a pair of clippers to cut some rough claw shapes in the right size. I glued them into place and then shaped them with files and sandpaper. The results was fantastic. I think that they're even more sturdy than the original one I was given. It didn't even take that long to do. Batman didn't really have any issues, but the Batpod required some research as well. Sadly, there are few photos of the finished model online, but find pictures of the original prop was easy to come by and that was all I needed to figure out how the thing went together. As I type this only two of the three sets are complete, but I've already really enjoyed this project quite a bit. Sometimes even an imperfect model can be a lot of fun to finish. Although I've been commission painting pretty consistently since 2010, it's only been 4 months since I started doing it exclusively and I thought it might be a good time to reflect on what I've learned so far. Certainly my biggest mistake going in was scheduling myself to go to two conventions in February. This set me back almost two weeks even though I was able to get some work done on the large Malifaux project while at Templecon. I really shouldn't have done this as I'm only just now completely caught up from that misstep. Aside from being a little behind for a month, this has left me in the dark in terms of learning what my capabilities really are in terms of scheduling work. I have a feeling that I can schedule myself a little more work per month than I've been doing. The fact that I was able to so quickly catch up on the work I had fallen behind on was encouraging. Still, I don't know if that was because I was pushing myself with long hours and no days off until it was done or because I just had more time available than I thought. Perhaps I should time myself better in the future. Something else I've learned is that there's a lot more time involved in logistics than I thought. The e-mails, packing and shipping, supply runs... this all takes time and when you are responsible for everything all of those tasks take time away from painting. These are the things that I just didn't think about previously. You never know where you work is going to come from. I've gotten huge projects by posting short comments on Reddit and Boardgamegeek. Not pitches, mind you - just short responses to people looking for painters with a link to my site. At some point I'm going to do some specific marketing related blog posts for those looking to do this kind of work, because I find it really interesting, but also because I see a lot of people who want to do this kind of work but clearly have no idea about how to market themselves. Probably the most important thing that I've learned (or maybe "confirmed" is a better word) is that I LOVE building and painting minis. It would be nearly impossible to do this if I didn't and it just makes me happy to know that, at least for now, I can make ends meet doing the thing that I love. I haven't been this happy in a long time. I started creating painting videos on YouTube in 2010. 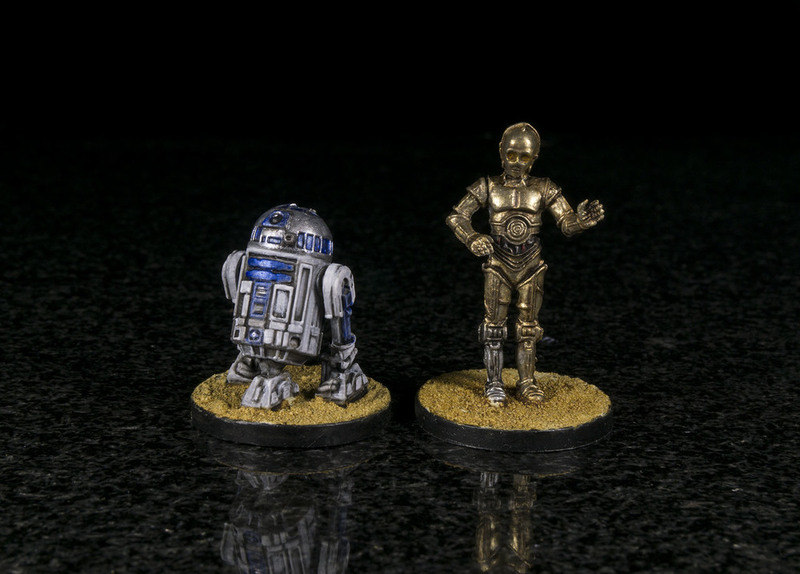 The original idea was to promote my new commission miniature painting service while providing some tips and tricks for painting minis. As time went on I realized that I really just enjoyed sharing my techniques with people and people seemed to be interested in what I had to say about painting. Of course, the BEST part is when somebody shares something that they've done based on a technique that the learned in one of my videos. For example, Aaron Utley painted these TIE Phantoms using the techniques that I shared in this video. I think that, in some ways, his execution is better than mine. I see a little more subtlety to the crackling energy that I didn't quite get (painting on that texture is rough!). I never get tired of hearing how I might have helped encourage you all to paint. It's very motivating. It makes me want to continue to paint and share what I do.